Cats! Creatures of mystery intimately intertwined with humans since the Stone Age, inspiring respect and fascination! The beginnings of domestic cat breeds, the first “modern” felines, appeared somewhere around 7000 to 5000 B.C. in northern Africa. This was when a few small, tabby-striped wild felines arrived in human settlements. Thus began the process of domestic cat breeds, spurring some of the most intriguing types of cats seen today. 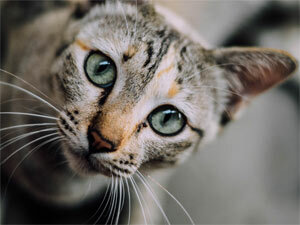 Our list of cat types covers a wide array of breeds from common pet cats to the exotic cat. Each cat guide offers cat information on background and development, the breeds individual cat behaviors, and cat care. Pictures of cats are provided with each cat guide to help in choosing a pet or aid in cat breed identification. - Beautiful wild cats! Cat guides for exotic cats include keeping them as pets, history, descriptions, and cat care, with pictures of exotc cats. - Intriguing and unique! 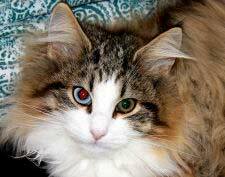 Hybrids are developed from crossing two different breeds or species of cat. List of the types of hybrids, cat guides for each hybrid with descriptions, pet cat informtion, care, and pictures of cats. - Incredible cat body-type mutations, list of mutation cats, and the types of mutations. See cat guides for each domestic cat with descriptions, care, and pictures of cats. - Fascinating domestic cat history from ancestry through evolution of the cat. See cat guides for each of the natural breed cats with descriptions, care, and pictures of cats.